Want to spice up your fall? 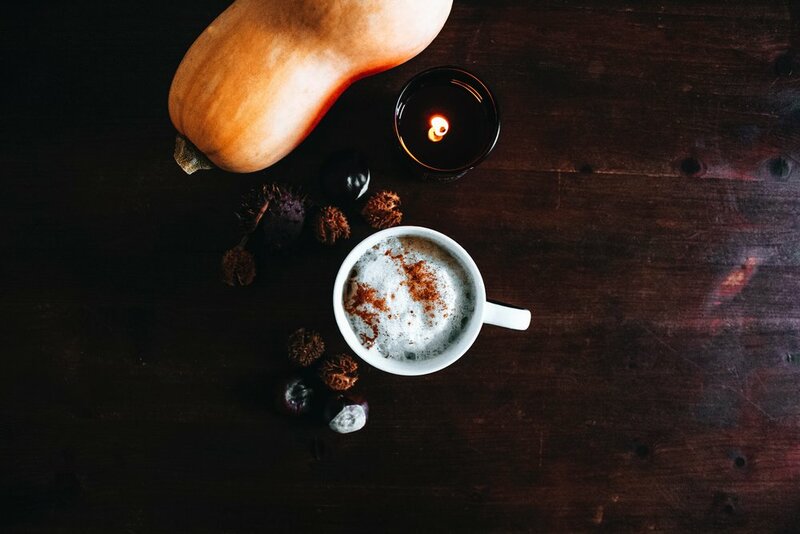 Ditch the hot chocolate and keep warm with the delicious Pumpkin Spice Latte. Created by Fell Stone Manor executive chef, Becky Geisel, a tasty, organic, and healthy fall treat is just what we’ve been waiting for. Made with a mixture of fresh and homemade ingredients, topped off with a sweet dollop of whipped cream and nutmeg, it’s safe to say your favorite fall indulgence is finally here! 1) Add milk (your choice 2% or almond), homemade pumpkin puree, maple syrup, cinnamon stick, ginger, ½ vanilla bean, cloves + nutmeg to sauce pan. Bring to a simmer. DO NOT BOIL. Allow the milk and other ingredients to simmer for 20-30 minutes to allow the flavors to blend together. 2) Remove from heat and strain into another sauce pan. Discard solids. Bring milk back up to a simmer. Again do not boil or the milk will burn. Now with a balloon whisk, froth the milk on the stove. It usually takes me about 1-2 minutes of whisking to triple the volume of milk. It should triple in volume. Remove from heat. Make your espresso shot. 3) Add your espresso to your favorite mug. Top with your frothed spiced pumpkin deliciousness. Spoon the froth carefully into your mug and then top with a pinch of fresh nutmeg. Or if you would like to indulge add a dollop of whip cream. Makes 2 cups, Enjoy!